Maler (1864-1941). 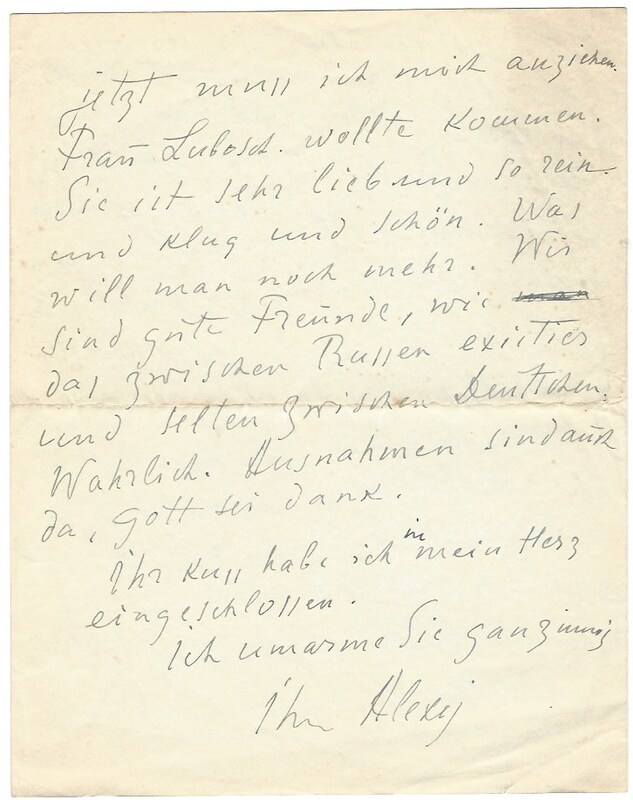 Autograph letter signed („Alexej“) and autogr. postcard signed („A. Jawlensky“). O. O. [Piestany?] und Wiesbaden. 4 SS. 4to und die Karte. 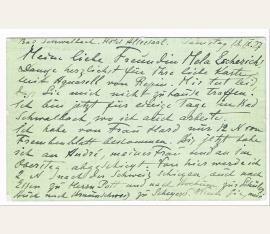 To art historian Mela Escherich (1877–1956), telling from his stay at a health spa. Russischer Maler (1864-1941). Eigenh. 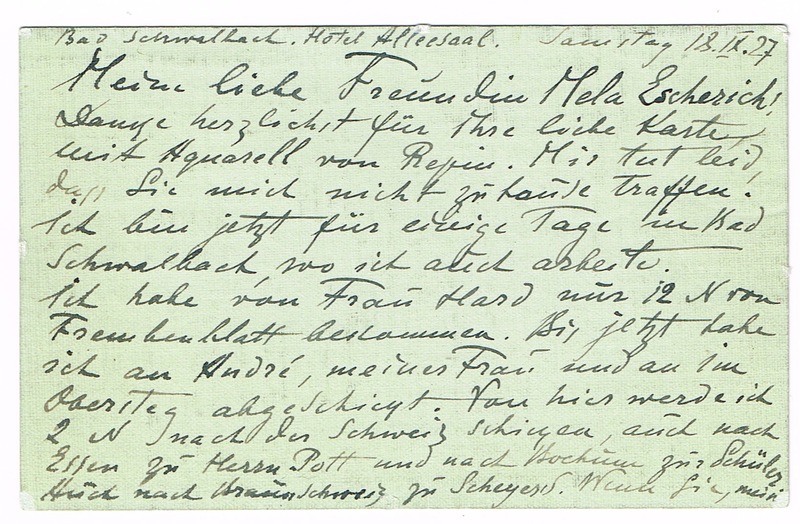 Postkarte mit Unterschrift u. monogr. Portraitskizze. Bad Schwalbach. 2 Seiten. Quer-kl.-8vo. An Mela Escherich (Kunsthistorikerin, 1877-1956). 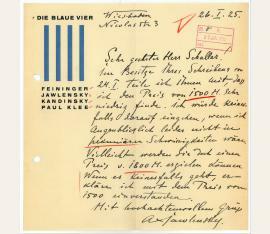 – Jawlensky bedankt sich für eine Karte mit einem Aquarell von Repin. – Berichtet über den Versand einiger Exemplare des ,Fremdenblattes’ u. bittet Mela Escherich um Mithilfe: „Wenn Sie, mein Schutzengel würden so lieb sein einige N[ummern] zu anderen Menschen schicken, werde ich Ihnen innigst dankbar sein“. – Die monogr. Skizze, etwa 3cm : 3 cm, in Feder u. Tinte zeigt einen Frauenkopf (Pieroni-Jawlensky IV, 623). – Mit zweizeiligem eigenh. 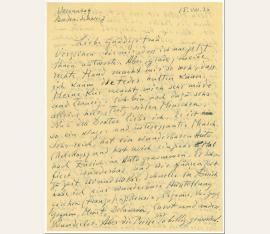 Gruß mit Unterschrift von T. Kirchhoff, wohl Tony Kirchhoff, Frau des Sammlers Heinrich Kirchhoff, die von Jawlensky mehrfach portraitiert wurde. russisch-deutscher Maler (1864-1941). Autograph letter signed. Baden (Schweiz). 2 SS. 4to. 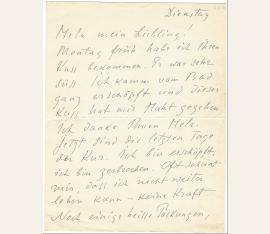 To the collector Tony (Antonia) Kirchhoff in Wiesbaden, written while taking the waters at Baden, Switzerland. 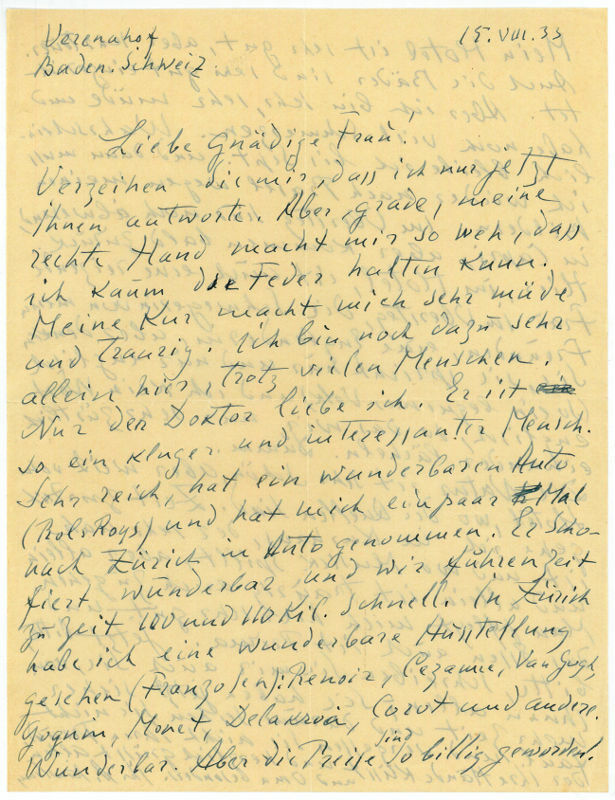 Jawlensky writes about about a trip to Basel, where he organised an exhibition of his paintings and attended a Marcel Gromaire exhibition. 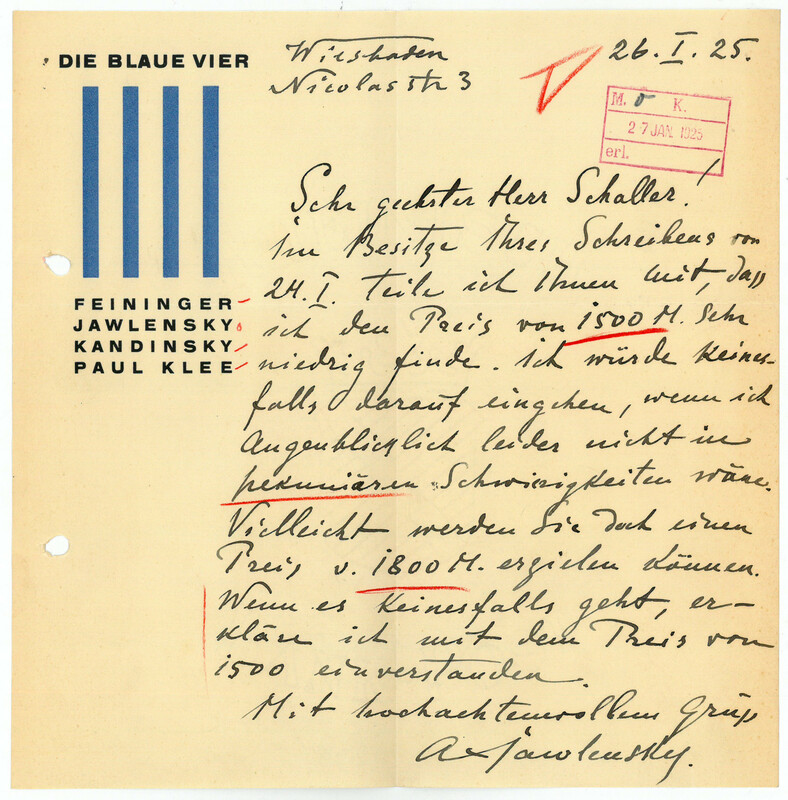 - Jawlensky was very close to the Wiesbaden collector Heinrich Kirchhoff and his wife and Tony; the relationship ended abruptly when it became known that Jawlensky and his frequent sitter Tony had been having an affair. 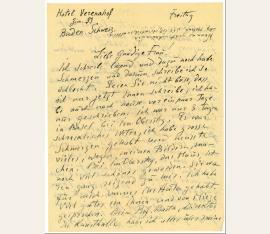 In German, to the collector Tony (Antonia) Kirchhoff in Wiesbaden, written while taking the waters at Baden, Switzerland. 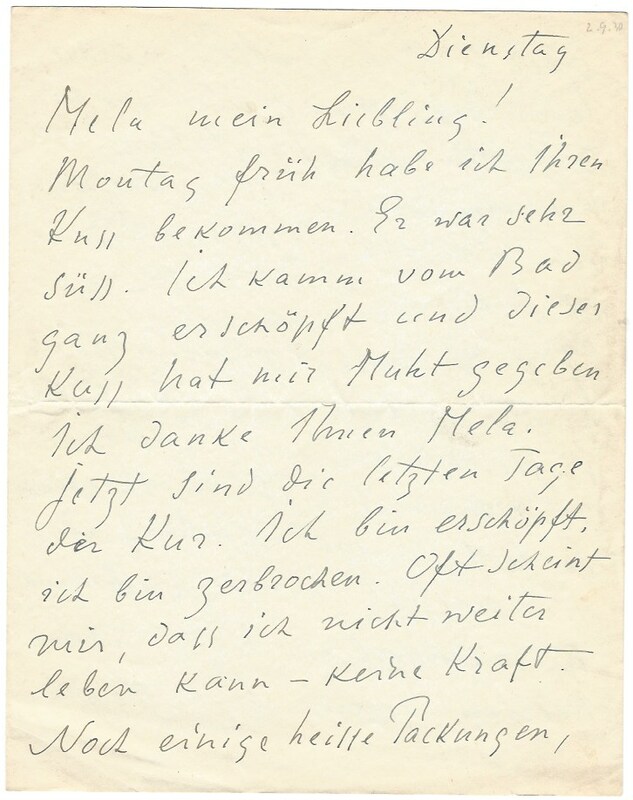 Apart from providing impressions of his spa cure, Jawlensky writes about an exhibition he has seen at Zurich ("a wonderful exhibition (French painters): Renoir, Cezanne, Van Gogh, Goguin, Monet, Delakroa, Corot and others. Amazing. But they have become so cheap! [...]" (transl. ), and about future plans. Maler (1864-1941). Autograph letter signed. Wiesbaden. 1 S. 4to. In German, to the Schaller gallery in Stuttgart, concerning the price of Robert Delaunay's painting "La ville No. 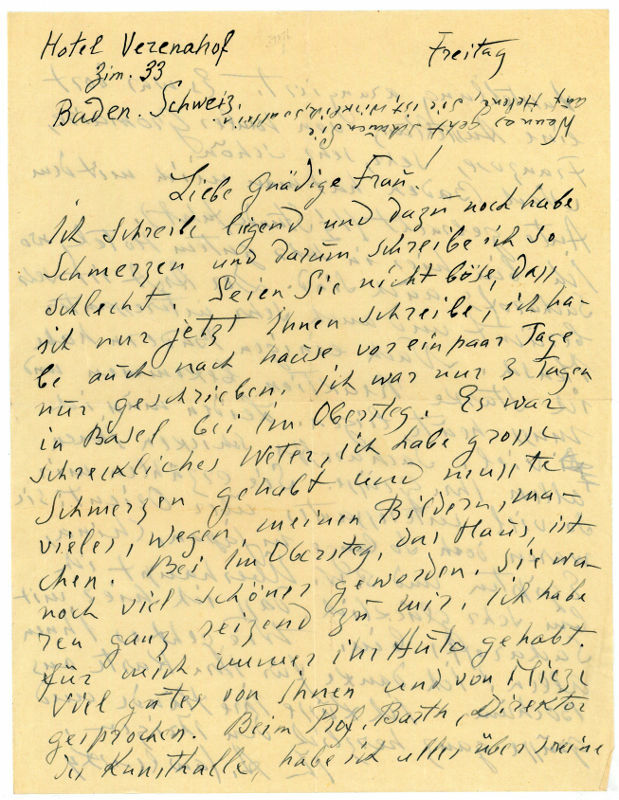 1": "In possession of your letter from January 24, I hurry to inform you that I consider the price of 1500 Reichsmarks extremely little. I would definitely not entertain such an offer it if I were not, unfortunately, in financial difficulties at the moment. Perhaps you will be able to obtain a price of 1800 Reichsmarks after all. If it is not possible at all, I will agree to 1500 [...] " (transl.). Jawlensky had acquired the painting at the first exhibition of The Blue Rider in Munich in 1912; in 1924/25 he tried to sell the work which today is considered lost. - Some marginalia in red pencil, probably in the hand of the gallery owner. Left margin with punched holes (not touching text) and with receipt stamp..